How to plan your weekend trip quickly? 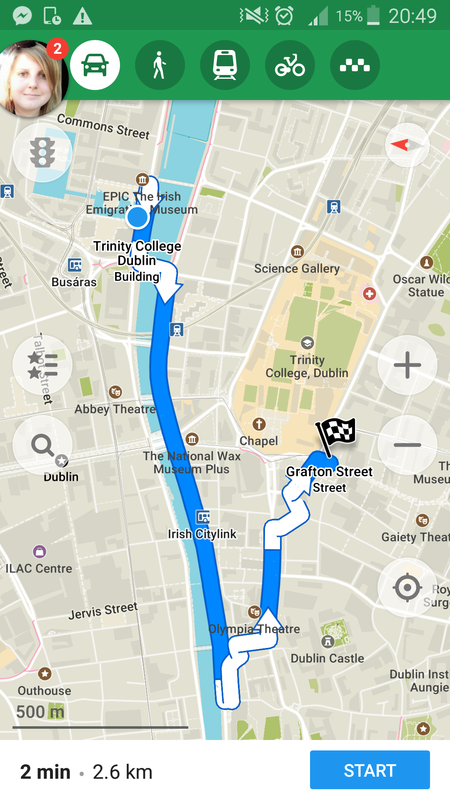 Sightseeing route in Dublin downtown taken by Maps Me Android app. Going somewhere during the weekend? Not a problem! 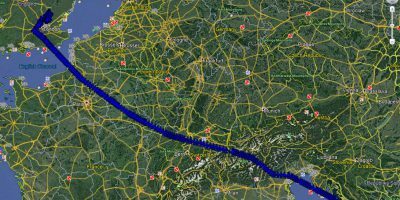 With a well-developed flight connections we are able to encounter a really long distances and move rapidly from one place to another. I don’t want encourage you to go from UK to South Africa and see the airport only. I would like to show you how to plan your weekend journey going to “near” places. Writing near I mean the destinations, that lies up to 3 hours flight from your place of living including long journeys by bus also. 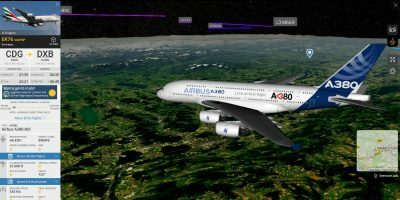 I am pretty sure, that after this article you will be able to plan your qeekend trip as quick as you can read this text. The flight may be not not nice when you feel uncomfortable (turbulences, etc). You cannot take a thing what you want (hang luggge policy) choosing the cheapest option of flight. I personally like to fly, although I know the people, who doesn’t. I commensurate them then, because flight is going to be a basic transport soon. I am giving you the advice of quick planning the weekend trip on mine examples. Recently, on December last year I went from UK to Ireland by plane. I will refer to my weekend bus trips too. Sometimes, when you are going far by bus, for instance to the different country on the weekend trip only you can experience the same situation like with the flight schedule. The best example is the journey from London to e.g Amsterdam by Megabus coach. Time frames of your trip vs acommodation. At least from my personal point of view the weekend starts at the moment of end the shift on Friday and finish at the time of beginning the shift on Monday. This is around 63 hours of free time, when you can enjoy the travelling. Maybe you will say, that I am riduiculous, but to be honest I can to function normally after one night without sleep. Though there is another matter, that should decide about the time of your trip, namely the acommodation. Do I really need 2 nights in Dublin? Everyone should considerate it, when base on flight connection frequency, period of year (day length), weather and another random factors. Sometimes we can make far better deal flying on Saturday morning rather than Friday night. Even some flights are cheaper on Saturday. Seeing this issue from the opposite side usually you cannot take the morning plane on your return journey unless you start at least at 10am on Monday. For destinations, with small frequency of flights during the weekend usually the flight schedule will decide on the time frame of your journey. When you travelling by bus or train, if you don’t mind your journey definitely should start on Friday evening and finish on Sunday night or Monday morning when possible. In this case you will spend 2 whole nights in the bus and another 1 night in the hotel. In worst-case scenario you won’t sleep for 2 nights, that could be quite exhausting. Deciding for the journey like this you need to know your organism well and be sure that you will enjoy this trip anyway. Many flight options are to be found on your route map. Many deals can be offered, however most of them refers to the city-breaks longer than typical weekend. You need to calculate which offer is more profitable for you. It may depends on: season, level of attraction, etc. For instance mostly flight deals are offered (at least by Ryanair) in November but you need to decide is it worth? Where is a good weather in Europe in November? Should I make my trip despite the weather conditions? The time is also pivotal in planning the trip. I am not a person, who enjoy a slow-tourism and always have something planned to visit. In my opinion there is no place for slow tourism during the weekend trip. Especially when you are travelling quite far is good to do something nice and visit some places, when you are in different country in this short time. Possibly you can have a different opinion. You need also take in account the time of your travel and considerate: should I really go to Madrid for a weekend only? Or maybe should I save some holidays and go there for longer time, seeing also something extra outside the city. The quickest way to find some interesting spots in your destination is type the “Top 10….” In Google search engine. Depends what you want to find you will have choice of the following issues suggested by Google (Pic. 1). Pic. 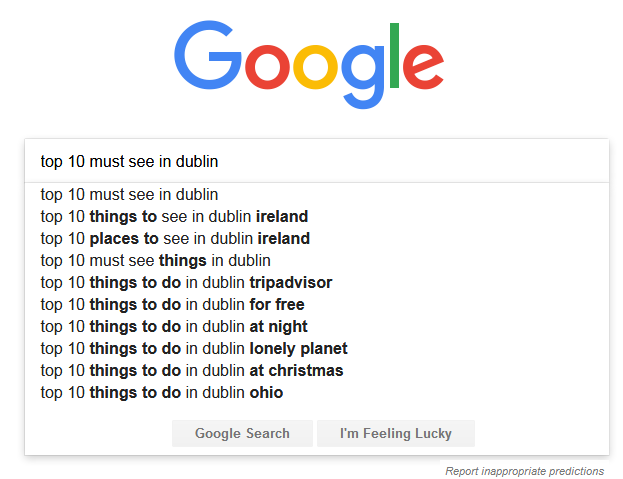 1 When you type “Top 10 muse see in Dublin” you usually have a lot of option of the following. Similarily when you type “top 10 acommodation…, “top 10 shops…”, etc. You can also use the TripAdvisor or download proper tourist guide apps for your destination. There is a lot of options, that help you get around in the destination are, however your further action will be required for make a plan of the trip, set the most convenient route and manage the costs. When you are struggling with the trip route always the navigation will be helpful. I use Maps.me navigation (Pic. 4), that is for free. If you have a bit more time you can make you route using the Google Maps (Pic. 2) . In My Google Maps (Pic. 3) application you will mark all places, that you would like to see and connect them with the most convenient route. The My Google Maps is available also for Android, so you will get your sightseeing route. You have to download it and run offline. Pic. 2 The example of the sightseeing route in Dublin following the planetware.com website. Pic. 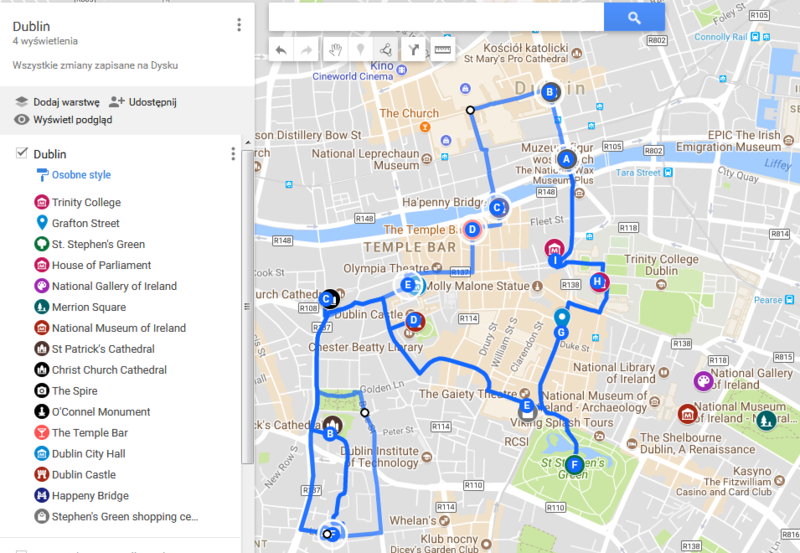 3 The same example of sightseeing route in Dublin prepared by My Maps Google tool. The signatures and colors has been chosen randomly. Pic. 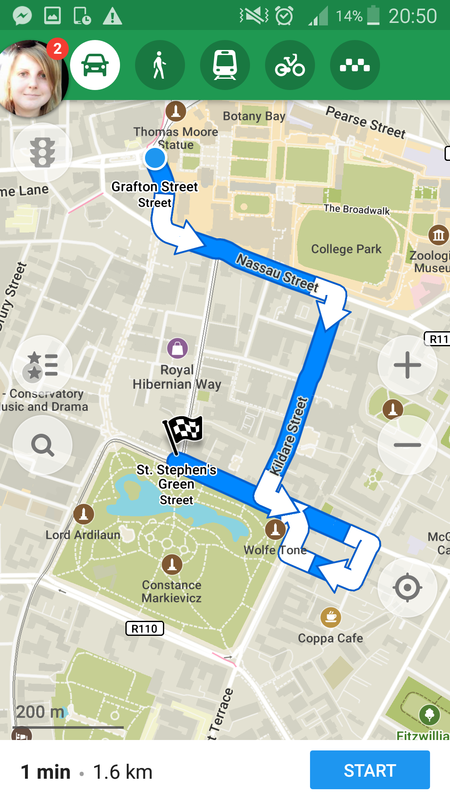 4, 5 Parts of the aforementioned route in the Maps.me app. Above I brought only a few the most popular places, that you can see in Dublin. As you san see this route is very short. 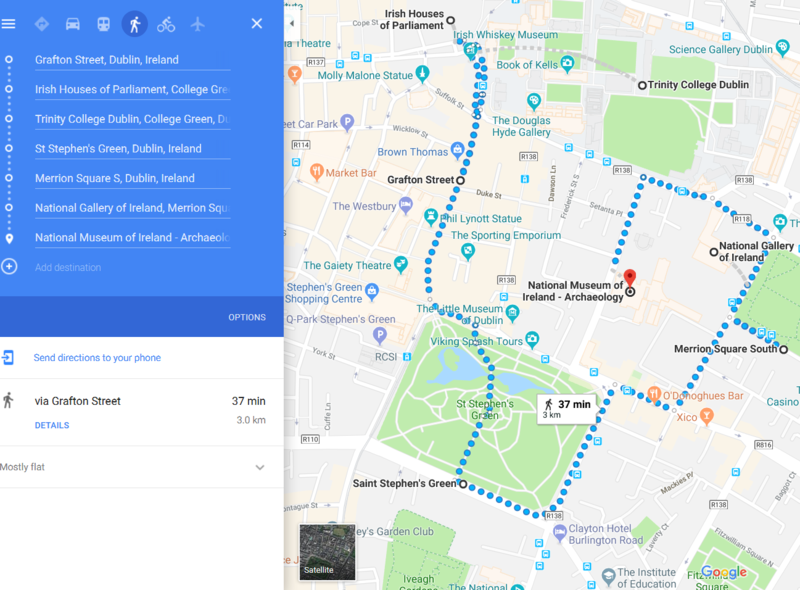 You always can find more places, that you would like to see in Dublin and modify your route. The pivotal role in your trip destination plays the local transport. Well developed bus network, trams and trains enable you to make your trip efficiently. Is much easier to plan the trip when the local transport is on a high level. Unless you would prefer sightseeing the city on foot. This is possible when your remarkable spots remains quite close to each other. Personally I used to visit many cities on foot, because I walk quite quickly and finally I can make even 20 km per day. Anyway even when you decide to visit your destination city on foot using partially the local transportation may streamline your trip. 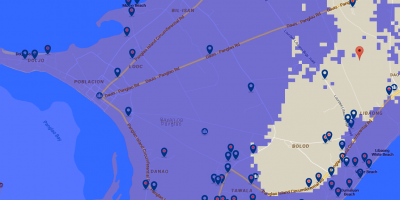 How to find local transport in your destination area? Still the best way is type in Google the name of your destination city and add “transportation” or “transportation map”, “local transport”, etc (Pic. 6). Having the transportation map opened you can quickly evaluate when exactly you will need to move from one place to another. Other way, far easier is using the Google Maps with selecting direction and choosing the “Bus” option (Pic. 7). The Tripadvisor is also helpful, especially in the places not well served by public transport. It can extend your procedure of preparing the trip, although a quite good trick is click Ctrl+F and type “bus”, “transport”, etc to streamline your search. Pic. 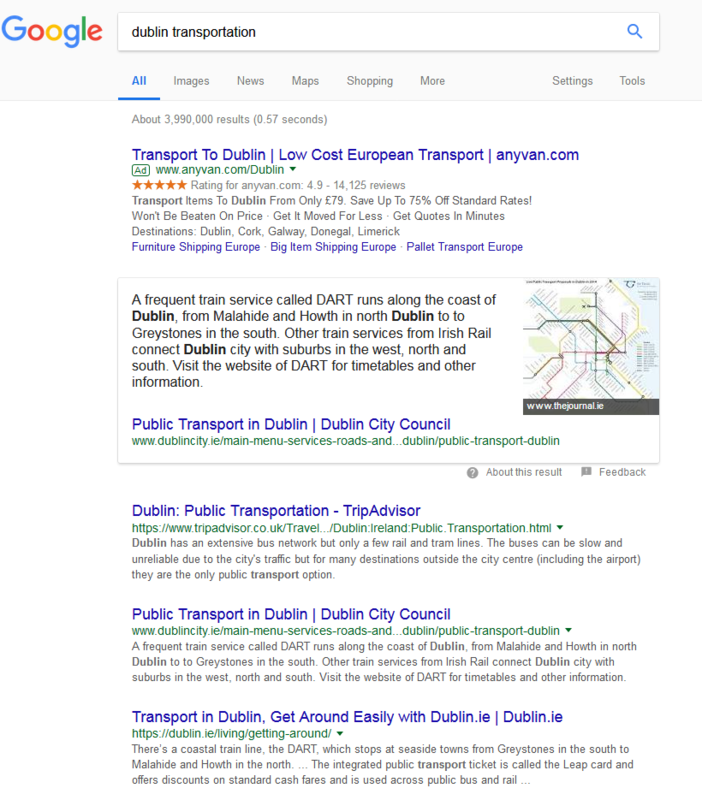 6 The search results of “Dublin transportation” in Google search. Pic. 7 The most actual connections from Dublin Airport (DUB) to the city centre (Grafton Street). The quickest way to calculate your route in majority of countries. Total time of your trip, determined by flight or bus connection. Places of stay, shops, leisure places, etc. 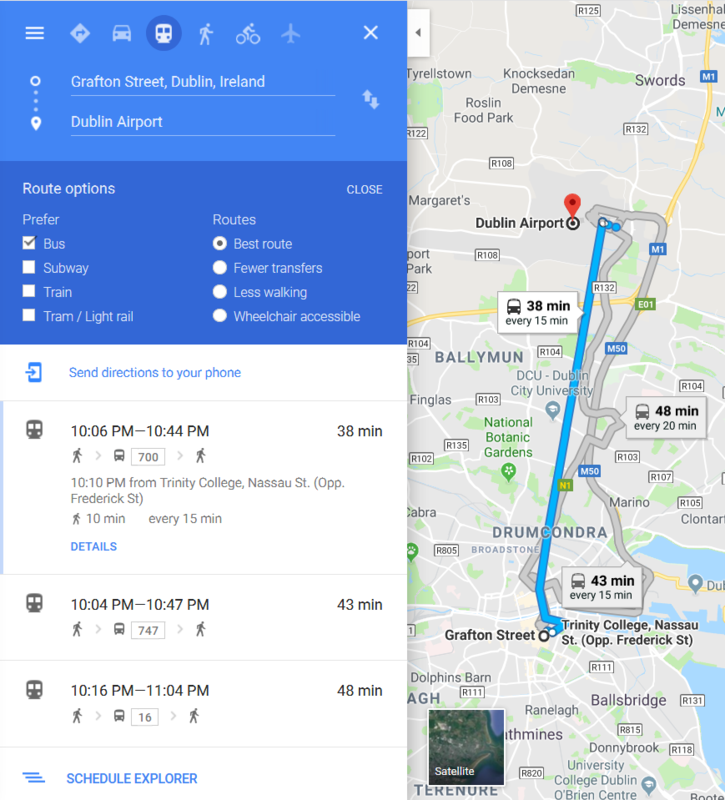 My sigstseeing route in Dublin was looking as per below (Pic. 8). I found another interesting places to see, although I have not seen all of them. Anyway when you find more interesting spots of your journey you can always make a choice being in your destination. Pic. 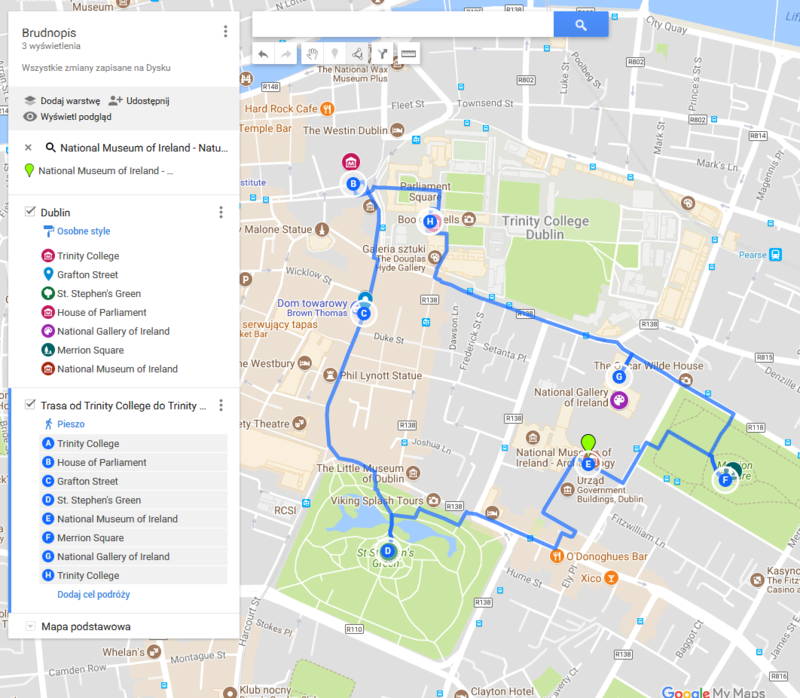 8 My final sightseeing route in Dublin with other optional places to see listed in in the My Google Maps layer. 6. You can easily and quickly plan a weekend trip using a few basic tools like Google search engine, virtual tour guides and navigation maps in your mobile device. Everything depends on your budget, plan and time. The most important are key words like “Top 10… I realize, that I wrote about obvious things, thus my goal was to show the quickest way to prepare a short weekend trip quite professionally within less than half an hour. The trip types in my point of view.